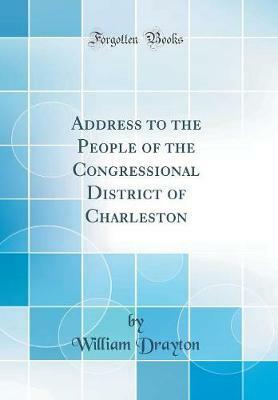 Excerpt from Address to the People of the Congressional District of Charleston For the vote which was given by me upon the final passage of this bill, all. The newspapers throughout the State, which are attacha ed to the doctrine of Nullification, have charged me rith having sacrificed the interests of my constituents, and with having acted inconsistently with opinions which I had previously expressed. Anxious that my fellow-citizens, whether they be my political friends or foes, should be in possession of the motives of my political conduct, in order that they may be enabled to determine whether I merit their confidence, or have justly exposed myself to their censure, I will submit to them the reasons that governed me upon the subject under consideration. About the Publisher Forgotten Books publishes hundreds of thousands of rare and classic books. Find more at www.forgottenbooks.com This book is a reproduction of an important historical work. Forgotten Books uses state-of-the-art technology to digitally reconstruct the work, preserving the original format whilst repairing imperfections present in the aged copy. In rare cases, an imperfection in the original, such as a blemish or missing page, may be replicated in our edition. We do, however, repair the vast majority of imperfections successfully; any imperfections that remain are intentionally left to preserve the state of such historical works.